It’s going to be a little while before any new art emerges as I’m busy doing photo shoots and preparing more art assets, so it’s a good time to post on another of my influences. 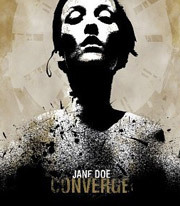 Jacob Bannon is a recent discovery of mine, which came about through friends recommending a band called Converge. 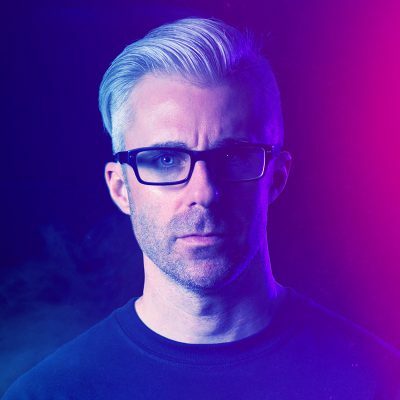 Bannon is the band’s frontman as well as their artist. The first word that comes to mind when Converge starts on my iTunes is violent, but the second word is thoughtful. This duality doesn’t happen a lot in modern metal, but somehow Converge manage to pull off a sound that is harsh, loud and fast but also soulful and beautiful. After getting into the band it came as a surprise when I was told Bannon did all of the beautiful artwork that graces their covers, posters and shirts. And once again Bannon manages to execute very angry images with grace and beauty, and this duality is why Converge has become one of my favorite metal bands going. Bannon uses a very painterly style involving a lot of texture and splatters mixed with corroded typography and digital manipulation but he holds a very strict design sensibility. His compositions are well thought out as are his color choices and use of imagery, which make his artwork very iconic. He is one of the rare cases where I can’t figure out how he does his stuff. Jacob Bannon has become a very important influence of mine because he fuses art and music together almost effortlessly. In short, his art is how his music would look if it were physical. I am a designer and an artist as well. Jacob has impressed me time and time again, both musically and artistically. Your Converge crit is spot on. 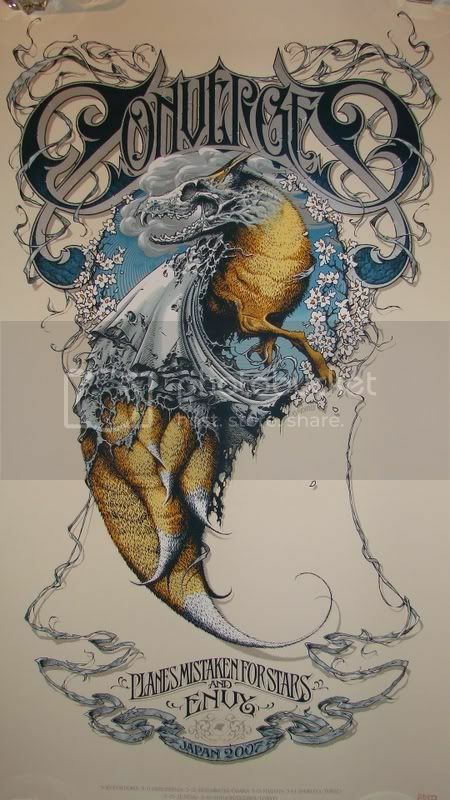 Converge is definitely my favorite metal band.And Jacob Bannon is amazing,by the way,I’m pretty sure he uses alot of digital maniplulation / screenprinting to make his designs. Jacob Bannon is the man. I make a majority of my work by hand. Ie: I do not use Photoshop brushes/effects in my work. I’m not that technologically advanced to do such a thing. My use of a computer is extremely basic in that regard. It’s a great tool to clean up images, but I don’t see it as a creative tool by itself. Many commercial projects I work on require a great deal of versatility/flexibility in their uses and sizing. Because of this, I tend to construct pieces physically in layers, and will scan those elements for later use. Photography also plays a major part in what I create. Jacob Bannon is amazing… converge too !